The okapi also known as the forest giraffe or zebra giraffe, is an artiodactyl mammal native to the northeast of the Democratic Republic of the Congo in Central Africa. 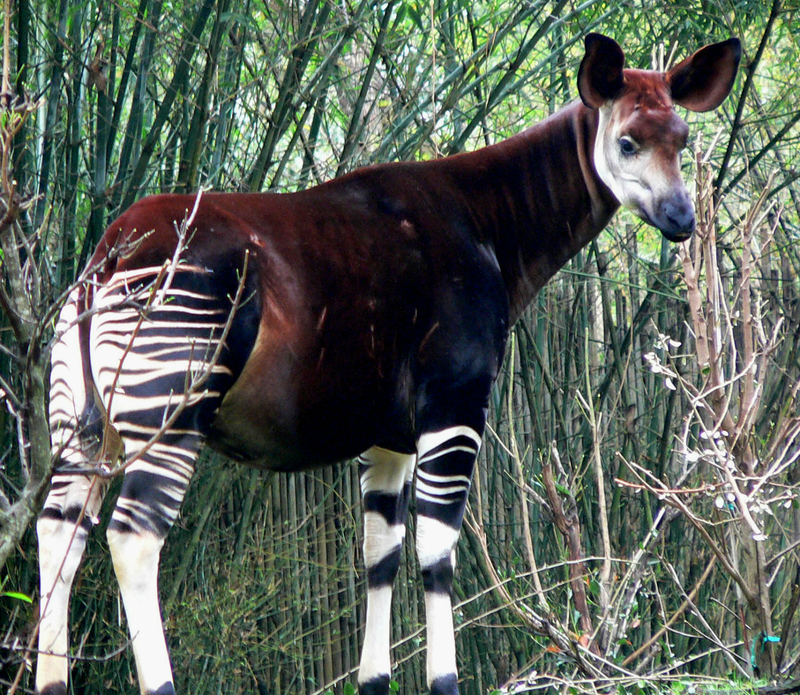 Although the okapi bears striped markings reminiscent of zebras, it is most closely related to the giraffe. The okapi and the giraffe are the only living members of the family Giraffidae. 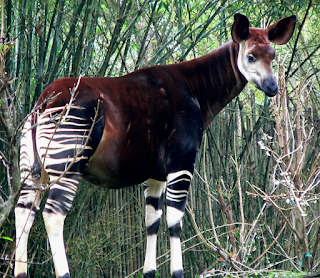 The okapi stands about 1.5 m (4.9 ft) tall at the shoulder and has an average body length around 2.5 m (8.2 ft). Its weight ranges from 200 to 350 kg (440 to 770 lb). It has a long neck, and large, flexible ears. Its coat is a chocolate to reddish brown, much in contrast with the white horizontal stripes and rings on the legs and white ankles. Male okapis have short, hair-covered, horn-like protuberances on their heads called ossicones, less than 15 cm (5.9 in) in length. Females possess hair whorls, and ossicones are absent.